About | Peabody High School National Alumni Association, Inc.
PHSNAA – Peabody High School National Alumni Association, Inc.
As a collective expression of gratitude towards Peabody High School, we form ourselves into this association so that our work and dedication will strengthen and support our Alma Mater, and that memories of our school life will be kept alive. In addition, we will support alumni involvement in student service functions of the middle school; providing expertise and opportunities to current and prospective students. * Act as a unifying agency in the Tri-cities area, dedicated to servicing PHS – Peabody Middle School. * Promote professional growth and rewarding outstanding Peabodians. * Encourage and maintain a friendly relationship among alumni, faculty, staff, and non-faculty PHS personnel. * Stimulate and maintain a spirit of loyalty, love and pride for our Alma Mater. 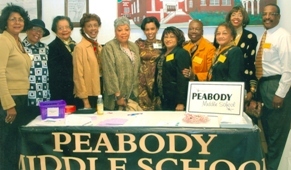 * Organize and mobilize the collective strength of the alumni for the purpose of keeping Peabody’s legacy alive. * Assist with maintaining the Peabody Middle School, Peabody Building and Giles B. Cooke buildings.